The Tonidandel residence is located 500 meters from the ski lifts and 500 meters from the village center, enjoying an amazing panorama of the surrounding mountains. Our property offers all the comforts needed for a sport, relaxation and family holiday; There are free parking spaces for guests and free wi-fi. In addition, our guests have a large 2000 sqm garden, sunny and equipped with sun loungers, barbecue and everything you need to enjoy the sun and the open air. For the younger guests there is a playground and a lodge equipped for their leisure. There is a deposit for various sports equipment such as skis, bicycles, sledges and strollers. 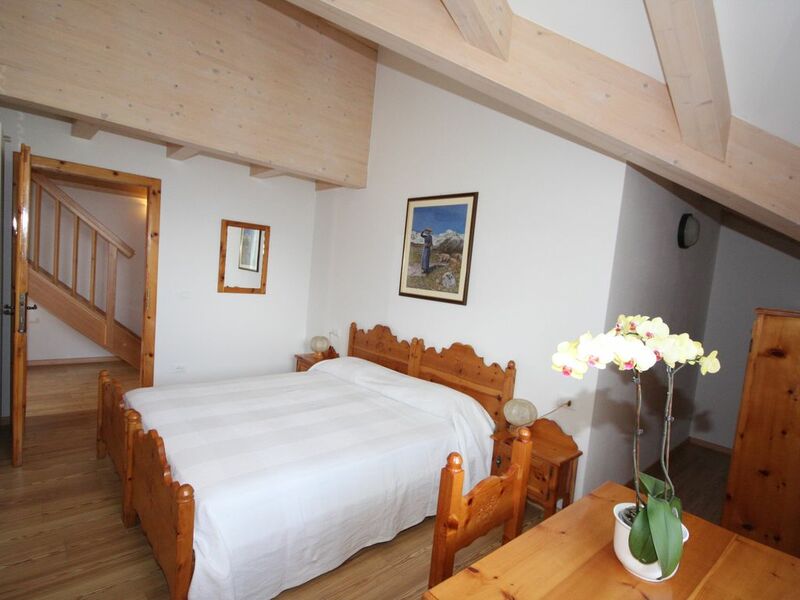 In a warm and welcoming environment, this new apartment, furnished in Alpine style, can accommodate up to eight people and has two bathrooms. Located on the second floor, it has a large kitchen-living room with two balconies overlooking the mountains of Brenta and Paganella, two double bedrooms, bathroom with shower and a comfortable staircase from the living room connected to the mezzanine where there is The third room with three / four beds and a second bathroom with shower. Equipped with dishwasher, washing machine, safe, free wi-fi, central vacuum cleaner, digital TV, on request cot with washbasin and children's changing equipment. Do Paganella is just 10 km from Lake Molveno and 5 km from Andalo. It is 29 km from Trento and a 20-minute drive from Mezzocorona Train Station and the motorway exit. In the immediate vicinity restaurants and supermarket. Make Paganella is on a green and sunny plateau on the slopes of Paganella, with a beautiful panoramic view of the Adige Valley. Ideal destination for those who are looking for a holiday that combines sport, relaxation and sunshine. Do is a great starting point for many pleasant hiking, mountain biking or horse riding in the lush meadows and the freshly brewed forests of the plateau, where clean air and contact with nature make you forget the stress and the frenetic pace of life modern. Particular mention is the gymnasium courses held each summer at the sports center, organized personally by the great Olympic champion Yuri Chechi. Among the sportsmen make it is known mainly thanks to the Skiarea Paganella, an avant-garde district linked to the country with modern lifts. Wide and sinuous slopes, always perfectly snowy and of all levels immersed in an incredible panorama make the joy of alpine skiing and snowboard enthusiasts, who also have a well-equipped snowpark, while the little ones can learn to ski amusing in the wide Playground on the snow Paganella Fun Park. For those who want to explore the mountain in winter away from the slopes, there are not many beautiful snowshoe hikes and mountaineering routes in the Adamello Brenta Nature Park. In summer, the plateau of Fai invites you to pleasant hikes between the green of its meadows and the shade of its forests. An easy itinerary for the whole family is the didactic route to the archaeological excavations of Doss Castel, which brought to light the remains of ancient settlements dating back to the Bronze Age, the late Neolithic and the reticulum period. Not far from the excavations there is a life path, the beautiful panorama point Madonnina del Belvedere and Calcara, an ancient furnace where limestone was worked to obtain lime, while other itineraries of particular interest are the Ardito Alberto path and the thematic route Way of Waters. We enjoyed our holiday in Paganella, Emanuele was very kind and helpfull. Eine Woche in herrlichstem Herbstwetter mit unserer 6-köpfigen Familie in dieser herrlichen Gegend - das bleibt hängen! Emanuele und Ivana sind sehr nette und liebenswürdige Gastegeber. Emanuele spricht perfektes deutsch. Fai della Paganella ist wunderschön gelegen mit vielen tollen Ausflugsmöglichkeiten. Gerne wieder! Fam. Tonidandel ist äußerst zuvorkommend und auch die Wohnung war in Top Zustand mit Waschmashcine, Spühlmashcine, etc. Auch die Kinder sind im Garten voll auf ihre Kosten (Spielhütte, Trampolin, Schaukel, etc.) gekommen. Uns hat der Urlaub sehr gut gefallen. Die Wohnung ist sehr schön und optimal eingerichtet. Wir hatten einen erholsamen Aufenthalt. Viele Grüße und auf ein nächstes Mal! Uns hat die Gegend sehr positiv überrascht, der Ort ist auf einem Hochplateau gelegen und von malerischen Bergen umgeben. Die Unterkunft war sehr schön, der Vermieter war sehr umgänglich und freundlich. Besonders für Kinder ist der große Garten mit Spielplatz zu erwähnen, dort können sie ausgiebig rumtollen, aber auch im Ort gibt es viele Möglichkeiten mit mehreren Spielplätzen. In der Wohnung war alles vorhanden, wir waren rundrum zufrieden.